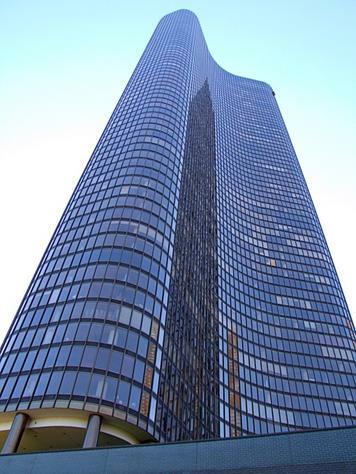 Lake Point Tower, at 505 N. Lake Shore Drive is also known as “The building east of Lake Shore Drive,” “The black building by Navy Pier,” and “Oprah’s Building” despite the fact Oprah never lived in the building!! Lake Point Tower is an icon in Chicago’s skyline. But lets learn some more about it. What do condos sell for in Lake Point Tower? How much are assessments in Lake Point Tower? Are any of the units updated in Lake Point Tower? Lake Point Tower Private Residences was built as apartments in 1968 and was converted to condos some years later. There is an old law on the books that no private property can be built on the Lake front property. The developer of Lake Point Tower actually found a loophole in the law and drove the pilings of the building down into the lake waters underneath the land. This would mean that the building was technically “not built on lake front property” but instead built into the lake itself. Obviously the law has since been modified. What Condos are Available in Lake Point Tower? The building is made up of Studios (many converted to Jr. 1 Beds) around 700sf to large combined units well in excess of 3000sf. Over the years many units have been combined and cut up to take advantage of different views. The standard units are, however, Studios/Jr. 1 Bedrooms at 720sf, 1 Bedrooms at 1100sf, 2 Bedrooms at 1450sf and 3 Bedrooms at 1800sf. Studios and Junior 1 Bedrooms typically sell for the mid to high $200’s. One Bedrooms will start around the mid $300s and two bedrooms will start around $500,000. Three Bedrooms will start around $720,000 on up. What are the assessments in Lake Point Tower? The assessments are not cheap. A standard 1 Bedroom will run you around $450 to 600/mo depending on view and this does not include your heat or a/c as it is electric. Two Bedrooms will see assessments just over $700/mo to $980/mo and Three Bedrooms will see assessments over $1,200/mo. I know some of you may be scratching your head as to why assessments are more for the same square footage on a higher floor with a better view. The reason is that Chicago Condo Law requires assessments to be divided based upon the initial value of the condo and not the size. Since a higher floor unit with a preferred tier view will sell for more it will also have a higher assessment. What amenities are in Lake Point Tower? Lake Point Tower is a small little city. It has a private park, a pond, an outdoor pool, an indoor pool, racquetball court, expansive new fitness center, business center, 24hr door staff, dry cleaners, grocery store, building engineer….the list goes on. Are units updated in Lake Point Tower? Well, the building is old so there are many units that are not updated. However, there are some that have been completed rehabbed. The one thing to note about Lake Point Tower is that the floor plans are all about the view. The floor plans are wide to take advantage of window space to maximize your view. All the floor plans are fairly workable in order to upgrade. Bathrooms are typically small, however, so if you do upgrade you may end up taking some space away from your living area if you want a large master bath.